On July 16, 2015 the California Arts Council (CAC) announced the investment of more than $4 million in arts education across the state. 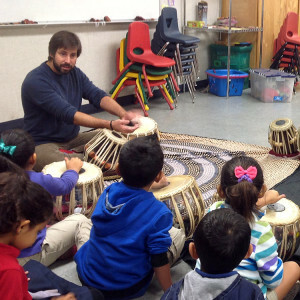 The Center for World Music is one of fifteen San Diego-based arts organizations to be funded through the CAC Artists in Schools grant program. 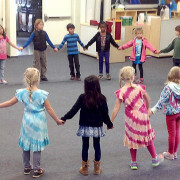 The Center will receive $11,400 in support for World Music in the Schools, a program that integrates world music and dance into arts learning for San Diego students. The CWM will use the grant to support four year-long, in-depth residencies providing instruction by professional native/native trained teaching artists in four selected K-8 San Diego area schools. 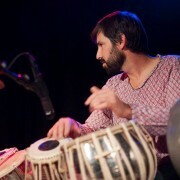 Traditional music and dance from India, Africa, Iran, and Indonesia will be represented. Weekly classes will be offered to both beginning and advanced students. All classes will be hands-on, providing group dance and music lessons. “This program is deeply appreciated by schools and students, and in high demand,” said Monica Emery, the Center’s executive director. “It is especially important in an environment in which funding for arts education has been drastically cut.” Emery cited studies demonstrating the positive effects of music education on self-esteem, discipline, and academic achievement. For further information, contact Monica Emery, executive director, 619.363.3007. Download the Center for World Music press release. See the California Arts Council press release. The berimbau (bee-rim-bau) is a single string percussion instrument, described as a musical bow with African origins. It is the main instrument used to produce the complex rhythms in Brazilian music that accompanies capoeira, a Brazilian martial art. The berimbau consists of a flexible wooden bow called the biriba or verga, a steel string called the arame, and a gourd called cabaça. 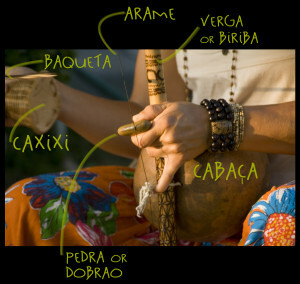 The berimbau is played with the help of a small, thin stick called the baqueta or vareta, a metal or stone disk called dobrao or pedra, and a caxixi (shaker). Biriba (verga) — The berimbau takes its name from this wooden rod, which is known as the backbone of the instrument. It can be made of many different kinds of wood, but the Brazilian species Eschweilera ovata (Cambess. ), of the family Lecythidaceae is considered to be the best material for this part of the instrument. Arame — Made from a piano string or salvaged from an automobile tire, this steel string has to be strong enough to withstand the tension of the biriba, as well as the battering of the baqueta. Its vibration produces the sound of the berimbau. 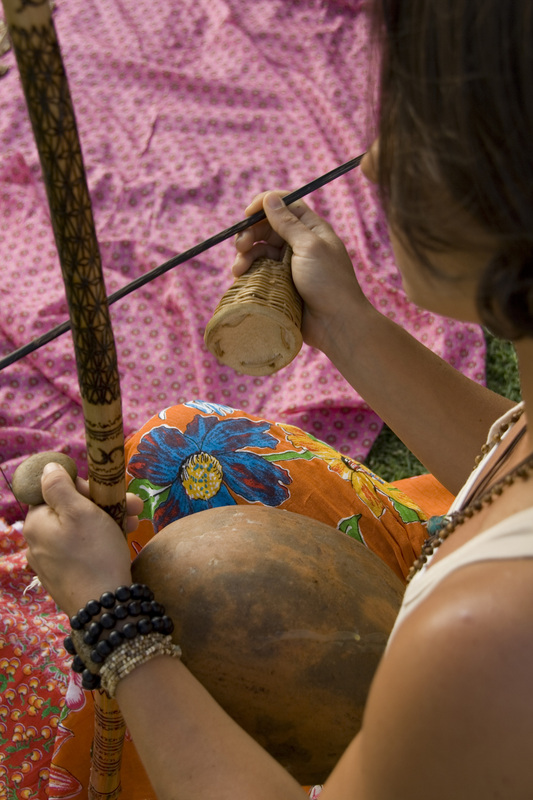 Cabaça — Made from a hollowed-out and dried gourd, the cabaça is used to amplify the sound of the arame. Baqueta — This beater is made from wood, and is used to strike the arame and produce sound. Dobrão — Usually a coin or flat metal disk, the dobrão is used to vary the sound of the berimbau. When touched against the metal string it produces a higher pitch, and when pulled away from the string the pitch becomes lower. As an alternative to the coin, some players use a small flat stone (pedra). Caxixi — A small percussion instrument, which consists of a closed basket containing seeds, which is shaken to produce a rhythmic sound. When played with the berimbau, it is held by a loop handle in the same hand as the baqueta, so that it shakes when the baqueta strikes the arame. It is believed that the caxixi summons good spirits, and wards against evil ones. 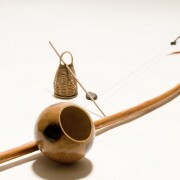 To assemble the berimbau, the arame is attached to both ends of the biriba and pulled taught, which bends the beriba into its characteristic bow shape. 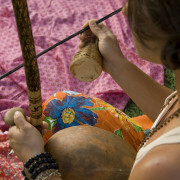 The cabaça is attached to one end of the berimbau with a lace, which also helps the musician support the berimbau with their pinky finger while playing. Gunga — This instrument has the largest cabaça (gourd) and the most flexible verga, and it produces the lowest pitch. 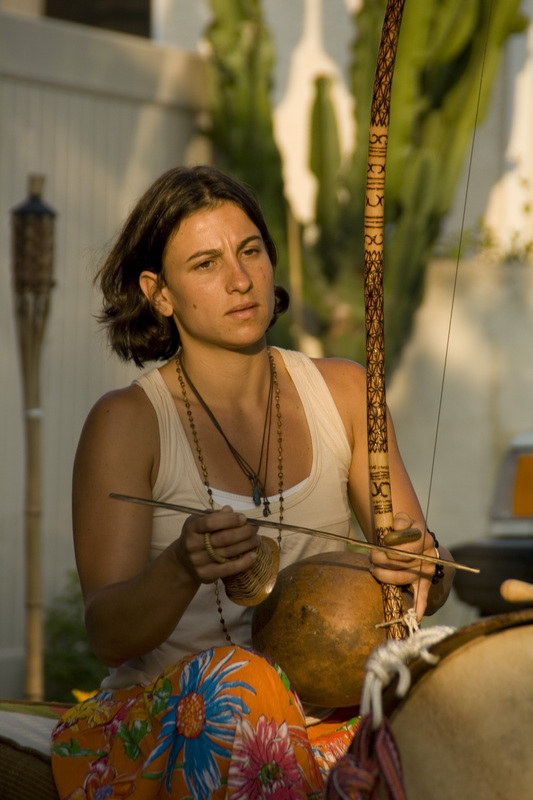 Médio — This berimbau uses a smaller gourd, with a tone and pitch between that of the gunga and the viola. Viola — With the smallest gourd, and a less flexible verga, this instrument produces the highest pitch, and is used to add rhythmic fills between the steady rhythm shared by the other berimbaus in the ensemble. 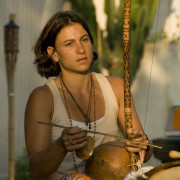 You can view Claudia demonstrating the berimbau on the Center for World Music’s YouTube Channel. Djoko Walujo Wimboprasetyo, respectfully addressed by his professional colleagues and his adoring students as Pak Djoko (“Father Djoko”), is one of the most highly regarded senior performers of Javanese classical music. An esteemed artist, court musician, and composer, he is one of the most sought-after instructors of Javanese orchestral music in the world. 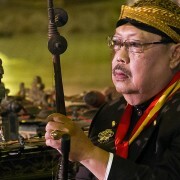 Pak Djoko is a distinguished grand master of the Javanese gamelan—an orchestra of some twenty musicians that varies in size, instrumentation, musical style, and social function. Typically, however, a Javanese gamelan includes tuned bronze gongs, gong-chimes, single- and multi-octave xylophone-like metal instruments, drums, flutes, bowed and plucked stringed instruments, wooden xylophones, and both male and female singers. 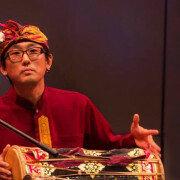 For more than two decades, Pak Djoko has directed Javanese gamelan ensembles at the California Institute of the Arts, at the Los Angeles Consulate General of Indonesia, at UCLA, at UC Riverside, at San Diego State University, and at Canyon Crest Academy in San Diego. 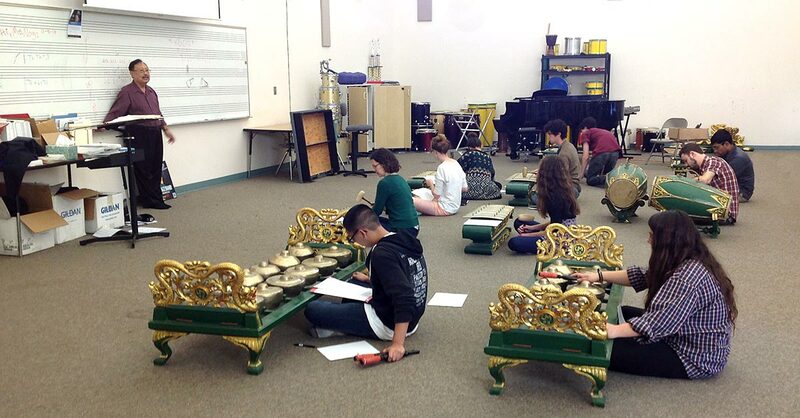 As a dynamic teacher of university students as well as K-12 children, Pak Djoko recognizes that gamelan is an excellent tool for music education. 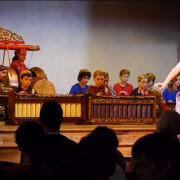 Indeed, anyone can learn to play gamelan, since no previous knowledge or experience is required, one learns and plays by ear, without written notation, and the simple playing techniques of the various instruments makes the musical experience almost instantly accessible to children and adults of all levels alike. Pak Djoko studied gamelan music in Java from an early age, under the tutelage of many well-known and distinguished gamelan teachers, including such luminaries as Raden Lurah Dhamowijoyo, Raden Ngabehi Prawira Pangrawit, Raden Mas Handoyo Kusuma, Bapak Harjaswara, Bapak Sunardi Wisnubrata, Bapak Promono, and Bapak Hadi Sumarta. He continued his studies in music at the Indonesian Arts Institute, Yogyakarta, and also in Indonesian law at the University of Gajah Mada. From 1975 until 1992, he served as professor of music at the Indonesian Arts Institute, after which he accepted the position of visiting artist at the California Institute of the Arts in Valencia, California. 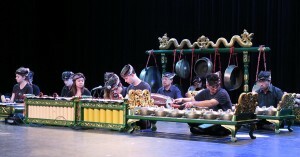 Significantly, Pak Djoko’s most distinguished teacher, K. R. T. Wasitodiningrat, a revered senior Javanese gamelan teacher residing in the United States, selected Pak Djoko to be his successor as the Javanese gamelan teacher at the California Institute of the Arts. Pak Djoko has performed widely, composed award-winning music for Javanese dance-dramas and shadow-puppet plays, or wayang kulit. He has received awards from the Javanese Ministry of Education, the Governor of the Special Region of Yogyakarta, Radio Republic of Indonesia, and the Governor of Central Java. 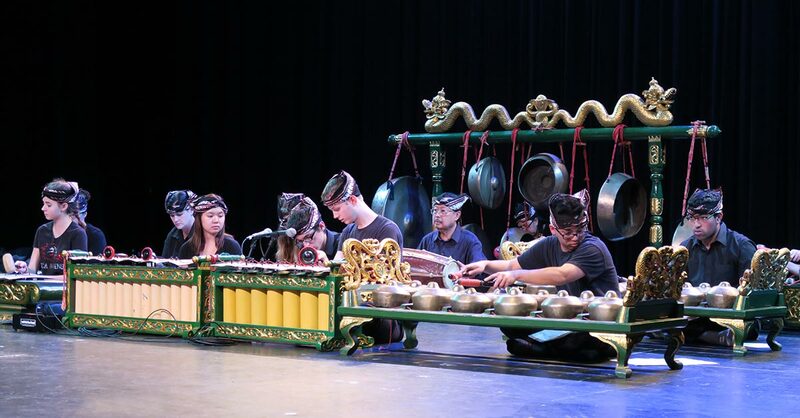 As the musical director of the Javanese gamelan ensemble at San Diego State University since 1992, and at Canyon Crest Academy since 2010, Pak Djoko has been the revered teacher of many students in San Diego. For the past five years, he has served as distinguished teaching artist for the Center for World Music’s World Music in the Schools program, which is partially supported by grants from the National Endowment for the Arts and the California Arts Council. 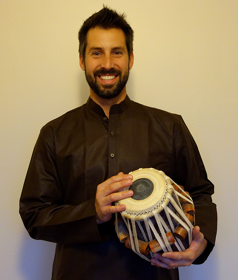 He has also served as artistic director of the Center for World Music’s gamelan festivals at Canyon Crest Academy and Ellen Browning Scripps Park in La Jolla. At his home in Yogyakarta, Central Java, Pak Djoko hosts musical soirées—in support of local Javanese musicians as well as for American university students studying gamelan in Java or traveling to Java in search of deep cultural immersion. The setar is a Persian (Iranian) stringed instrument with a small, pear-shaped soundbox and four metal strings. Its name means “three strings.” A fourth drone string was added about 150 years ago by the mystic Moshtagh Ali Shah. This modification gave the delicate instrument a “bigger” sound and more complex tuning possibilities. The resonating box of the setar is attached to a long neck that has twenty-five gut frets. The soundbox is made from mulberry wood, while the neck is made from walnut. 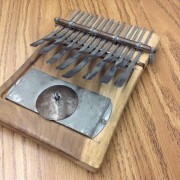 The instrument has a melodic range of just over twenty scale degrees. 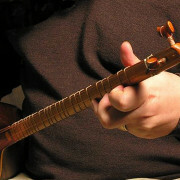 Although it is traditionally played with the nail of the right index finger, in the past three decades two distinguished master performers, Mohammad-Reza Lotfi and Hossein Alizadeh, have introduced new techniques to give setar playing a whole new life. Today the setar is generally considered the supreme instrument for performing Persian classical music. However, it was almost forgotten during the nineteenth and early twentieth centuries owing to the increased popularity of the tar, a similar but larger instrument with a fuller sound. The tar is a double-chambered string instrument that has three sets of double strings with the same fretting on its neck as the smaller, more delicate setar. In 1984, a pivotal recording of a setar solo performed by the master Mohammad-Reza Lotfi brought the smaller instrument to the attention of a whole new generation of Persian classical music enthusiasts. Indeed, Lotfi’s historic album, in memory of the great musician Darvish Khan, enticed many young instrument makers and musicians to fall in love with the sound of the setar, and thus a new generation of setar makers and players has recently emerged. See the setar in action on YouTube: Lotfi Taknavazi Setar Niavaran Concert. On Wednesday, May 6, the National Endowment for the Arts (NEA) announced that it will make a $55,000 award to the Center for World Music to implement world music and dance instruction in San Diego schools. The award was among 1,023 awards totaling $74.3 million made by the NEA nationwide in this funding round. 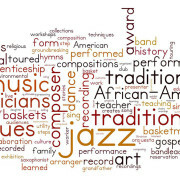 The grant was the largest grant for arts education awarded in the San Diego area, and the third largest in California. For more, see our press release and the announcement from the NEA.